The International Production and Processing Expo 2018 (Jan. 30 – Feb. 1) took place in Atlanta, Georgia, where thousands of meat industry representatives gathered to share their knowledge and innovations at this huge annual event. A headline feature of this year’s conference was the Pork 101 session, sponsored by Pork Checkoff, American Meat Science Association (AMSA) and Merck Animal Health, and co-sponsored by American Association of Meat Processors (AAMP), North American Meat Institute Foundation (NAMI) and the Southwest Meat Association (SMA). The session discussed issues in the quality and consistency of pork meat and value differences in swine, pork carcasses, pork primals and processed pork products and highlighted AMSA’s three-day ‘Pork 101’ conference. 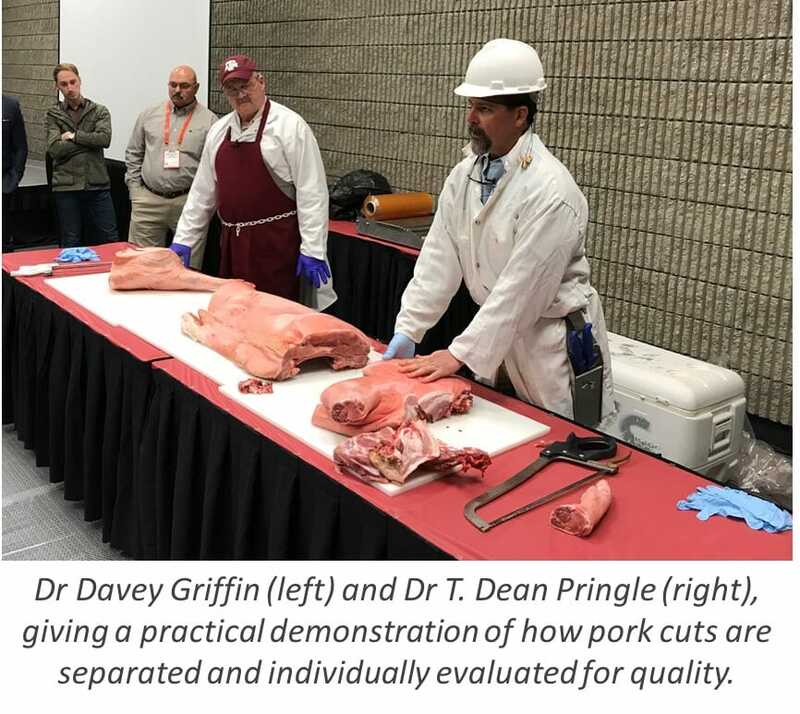 The Pork 101 conference is described as “a hands-on educational opportunity to update interested participants on quality and consistency issues in the pork industry”. The course provides insights on value differences in swine, pork carcasses, pork primals and processed pork products due to quality variation. It also provides the opportunity to evaluate eight live hogs which will then be processed during the class with participants learning about grading, food safety and product processing. With demand for consistently high-quality meat and meat products, it is important that meat industry representatives understand how pigs and pig meat are graded, and how they can play their part in attaining the best cuts, in the safest way. In the past, and to this day, there is compartmentalisation and fragmentation of the meat industry. Pork 101 is designed to help people understand the industry as a whole. It is about closing those gaps and putting all of that [each step of the meat production process] together. Another concern for the meat industry is how to consistently and accurately determine meat quality, and how each step in raising and processing a pig can impact upon this quality. Dr Griffin described pork ‘qualities’ as, “the attributes that make pork products a desirable, wholesome consumer-ready product”. He stressed how important it is to minimise variation in meat quality and identify ways to ensure this is achieved, as this will allow targeted consistency across the meat industry. There are certain methods of testing the quality of a piece of pork; its tenderness, colour, marbling, firmness and drip loss, are all tested factors that amount to a quality rating. A darker-coloured, tender meat, with low drip-loss and a higher marbling score, is understood to be a better quality, more flavoursome cut. Research has also indicated that there are interactions between quality factors, such as colour and drip-loss - a paler meat is associated with a higher drip-loss, and therefore lower quality. Colour is also associated with pH decline rate as the meat ages post-mortem – darker meats have a much slower rate in pH decline and therefore have the potential for a longer shelf-life. Achieving high quality meat is obtainable through proper husbandry and maintaining a high standard of welfare when raising the pig, but all of this can be undone if the same high standards aren’t applied all the way up to slaughter and during processing. Dr Griffin described how stress, among other factors, can drastically impact upon meat quality, and therefore, impact upon its monetary value. There are several pre-harvest factors that can exacerbate the stress levels of a pig and result in lower quality meat. For example, some pigs have a predisposition for stress due to selected genetics, whilst inadequate nutrition can increase stress-related hormone production, tainting the muscle. This said, improper handling and restraint techniques are major stressors on pig health and welfare, and, subsequently, have large impacts on meat quality. Unacceptable pre-harvest handling can result in carcass bruising and trim loss, transport losses in market-weight pigs and pork quality defects. Transport losses (dead and non-ambulatory pigs) are a growing concern in animal welfare, and also represent large economic losses. Transport losses and pork quality defects can be managed by minimising stress throughout the marketing process which can lead to a better live and post-harvest evaluation. With this in mind, it is important that stress is also managed during the slaughtering process as all of the hard work done up to that point can be undone through improper handling, moving and stunning. Post-slaughter carcass management is also crucial in ensuring the meat is not damaged by the scalding, evisceration, butchering and chilling processes. Despite there being many factors that determine meat quality, according to Dr Griffin, there are currently only two grades post-harvest: ‘acceptable’ and ‘unacceptable’. He says that pigs are harvested at such a young age so the differences are marginal, which has led to pork meat being paid for based on quantity and not quality. Producers are paid on a carcass weight basis where the dressing percentage (the live weight vs the carcass weight) is the most important factor. This, he says, leads to dramatic trade-offs in flavour and fat content. He believes that a better understanding of meat quality could lead to more accurate and consistent grading at live evaluation and post-harvest, and will therefore encourage those that are in contact with pigs and pig meat to adopt a higher standard of handling and treatment of live and dead animals. The Pork 101 course explores these topics, and much more, in detail, whilst allowing participants to observe and interact with each step of a live processing facility. Click here for more information on the Pork 101 conference.